Creatine Powder is recommended for sportsmen of all disciplines with particular regard to strength sports (such as body-building, three strength fight, combat sports). Creatine is recommended for the development of lean body weight and eficiency during high-intensity training. Recommended for use by body-builders undertaking regular training and sportsmen practising strenuous sports. Creatine occurs naturally in the human body. It facilitates energy production (ATP), stimulates the increase of muscle protein and therefore increases muscle mass. One portion (5g) in the morning on an empty stomach, second portion (5g) after workout. One portion (5g) in the morning on an empty stomach. Up to 20 g a day for 5 days. Maintenance dose: 8 - 10 g a day. The preparation should be taken regularly for 4 - 6 weeks. After 6 weeks a 3 - 4 weeks long break should be introduced. 1 teaspoonful contains 5 g of the preparation. It should be used for at least eight weeks to achieve optimal results. ACTIVLAB is one of the most respected brands among manufacturers of dietary and nutritional supplements for athletes and people, who have an active lifestyle. Among the company products, you can find carbohydrates, protein and amino acids, which support muscle building. There are also supplements which increase endurance during exercise and supplements to help reduce body fat. Acidity regulator – citric acid, aromas, sweeting substance E951, anti-caking substance: E551, dyes: E103 (lemon and orange flavour), E110 (orange, grapefruit and kiwi flavour), E124 (grapefruit, sour cherry and black currant flavour). 1-AD is aa powerful prohormne. Gives lean muscle gains with minimal water retention and minimal conversion to estrogen. The highest-quality source of the insulin-like growth factor 1, enhanced with colostrum. Beta-alanine. It reduces fatigue, and improves stamina, speeds recovery. A natural preparation with anabolic activity. The product is also suitable for women. Beta-alanine in capsules. It increases the level of carnosine in muscles, and improves endurance performance. Creatine monohydrate is a popular and cheapest form of creatine used in sports supplementation in Poland. This is a molecule, in which are bound: creatine molecule with a molecule of water. It has a high bioavailability and tissue velocity saturation. Supports the exercise capacity (strength and endurance), accelerates muscle growth and regeneration after training exercise. Transport of creatine into the muscle cells is supported by the insulin hormone. For better effect of saturation of the tissues, a diet increasing the content of insulin in the body is indicated (carbohydrate and high protein diet) and supporting nutrients and supplements (Dietary carbohydrate and carbohydrate-protein, insulin ALA, d-pinitol or taurine). Creatine monohydrate is present in the form of mono-preparation supplements (capsules, powders, tablets) and multicomponent supplements (i.e. 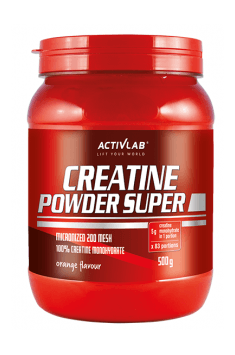 as a component of creatine stacks). - cyclic supplementation : 5-10g per day in 1-3 portions during the day, 3-5g per dose. The length of the cycle for 4-8 weeks. - constant supplementation: 0,03-0,05g per kg of body weight for an extended period of time. BCAA – all you need to know! Chest dips, why should you do them?